Teleportation – or – Pop Haydn is cool. I thought I would go old school with the title of this blog, like old movies that used to have two different titles. The perfect way to show the content, and it helps in all this SEO stuff that I don’t understand. Well at least I hope it does. Like I said, I don’t really get it… but I can build a teleportation device. A nice one. The story starts back many years ago. Back when I was doing this show at this restaurant. It was a parlor type show that I would do once a week, and we are talking about a place that has the word “shack” in it’s name. It wouldn’t be unusual to have a bunch of drunk guys there that would rather watch a football game. The only reason I did it, was because it was a challenge. It was a real challenge. Sometimes you had to go to extremes to get their attention. I also used it to try out new material, since I wasn’t get paid for it, just tips, which I got. Another problem was that when I would get families in there, they would tend to start coming every week, so I always had to have new material for at least a thirty minute show. One time, out of desperation, I built a teleportation device and used it one time at “the shack”. Yes, I did it without purchasing Pop Haydn’s DVD, and that was wrong of me, do as I say, not as I do… But! I only did it to test the waters, and for no bad reason, it didn’t work out. It never made it into my act that I get paid for, and I never did it again, but it was the beginning here. The teleportation device I built then, ended up being the one I built now. The first one I built was made from brass plate that I bended and soldered. The only real reason I used brass was because I had been using it for other projects. Matter of fact, my animatronic frog mechanics are made from brass, and built around the same time I built the first device. Five sides of a brass box were made and the front was just a piece of wood. There was a brass tube sticking out with a glow plug and an alligator clip at the end. I made a feedback circuit to make noise and had some switches for the glow plug, lights, and a potentiometer knob to control the noise maker. It was whipped together real fast, and was used once. Then it was thrown in with all my other stuff. Then it was scavenged and parts were used elsewhere. To it finally becoming a shell of it’s once self, in a box in storage. Skip to today. I am performing at AbraCornDabra this year and I have a brilliant idea for a routine. I have everything worked out except for one spot. I thought maybe I could fit the teleportation device into that spot. So this time I bought Pop’s DVD and went and pulled out my old device. What was left, was the brass box with a brass tube soldered to it, and the wood front with two push buttons left and the potentiometer with knob. The first thing I did was to make another noise maker. My first one was just a transistor circuit I put a speaker to. It was crazy. The noise changed even pushing buttons that weren’t even hooked up to it. The feedback was crazy, even putting your finger on the plastic knob and taking it off changed the noise. Weird. This time I wanted to build a better one. 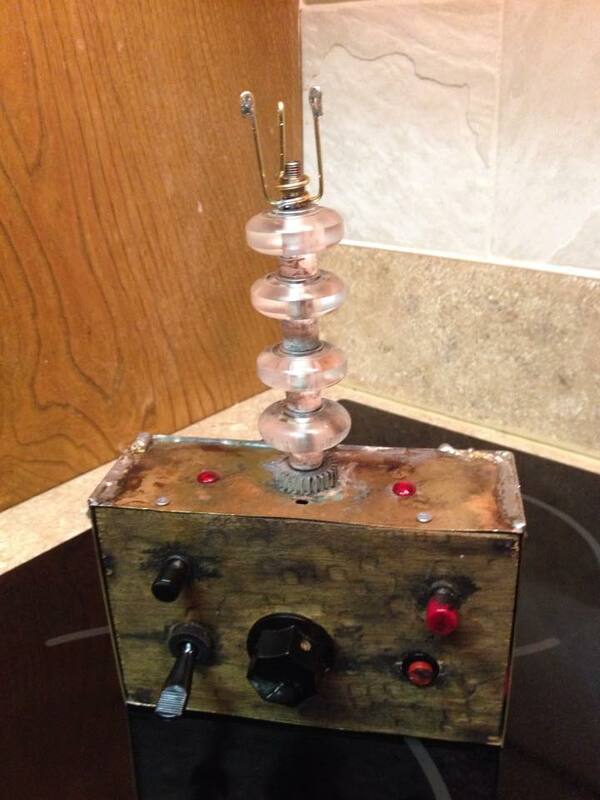 So I googled “DIY Theremin”, and I found a make it yourself project that made a Light Theremin. It was a simple little circuit that uses a 555 chip, which I have and use for other things. The circuit senses light by a photoresistor, so I just changed that to a potentiometer. That gave me the perfect sci-fi noises. I also added an extra resistor into the circuit and connected it to one of the switches. That made the noise shift in tone drastically, but technically it’s the same thing as turning the knob really really fast. I also added an amplifier circuit to it to make it louder. Once that was done, it was time to use another PicAxe chip, my favorite. People can say what they want about other programmable boards, but I am not building satellites or anything. I just need to light some LEDs, or move a servo, and with the PicAxe chip, I can do that easily with a language that I learned over thirty years ago. For this I used a 08M2 chip and made the pins go high and low in set patterns that I could change by putting a charge on another pin. The output pins, I just hooked the LEDs straight to them. The output charge is easily enough to light a LED. I even put a 100 ohm resistors between the pins and LEDs to protect them. Then one of the buttons is connected to the input pin. So every time you push the button, the LEDs change to a different pattern. There are five total patterns, but I could always pop out the chip and program more. Now it was time to build the section the LEDs were going. I knew I wanted to hint at old school technology, even a little bit of Frankenstein, which nothing says that more than clear disks stacked up. Plus I wanted to dilute the look of the LEDs as much as I could. That’s why I went with amber LEDs too. I had some half inch plexiglass already, I just needed to cut disks out and round them over. A hole saw would work perfect for that, but I didn’t have the right size. I should have went and bought one, but instead I decided to just use my router. Big mistake, I paid for it. Between the plexi blocks getting locked up in the drill press and spinning out of control with the router, my fingers are chopped up. A cut edge of plexiglass isn’t very forgiving. It can tear right through skin. I finally got my plexi disks and I stacked them up on the brass rod with painted spacers in between. The spacers are wood actually, but coated in plastic and painted to look like ceramic. It was spacer, instal the LED, plexi disk, spacer, LED, etc. Then I topped it off with brass rods bent and soldered into prongs. I didn’t want to go use alligator clips. In between the prongs I installed a glow plug, and with that, it is done. So I get Pop Haydn’s DVD. I had to work out a way to play it. I had to find my old DVD player and get it working. I watched the video of his performance, which was very funny. Then I watched him explain it, and then I watched him talk about building them. He named off some builders that could build one, and lo and behold, he mentioned me. I was honored. 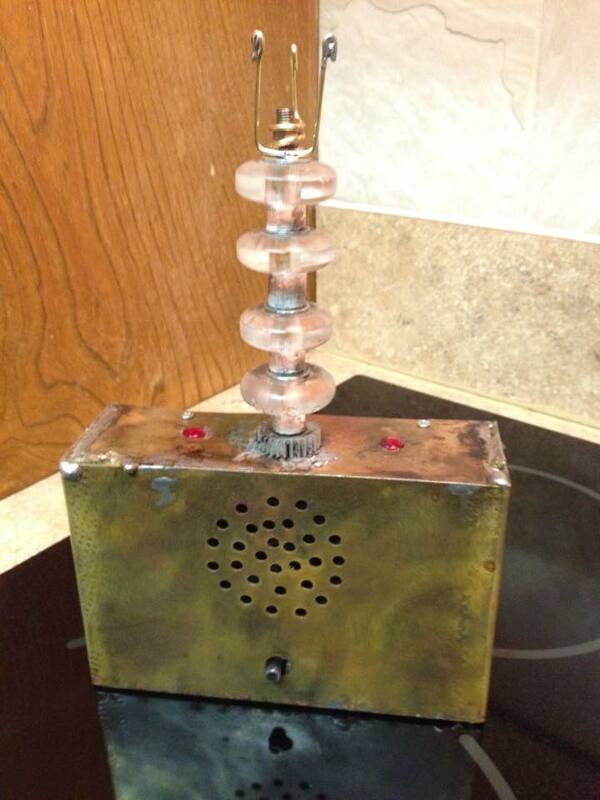 Then it showed pictures of other peoples devices, and it showed one I built for someone else with my website on it. I was honored again. Then when I posted on facebook that I purchased the DVD and was building a device, he emails me and gives me permission to make them to sell. Honored again. Like the title of this blog… Pop Haydn is cool. Unfortunately I don’t think I am even going to end up using it, because the act is evolving again.